As promised in my review (including a giveaway of a copy) of “Life in the Fast Lane” by Derval O’Rourke yesterday in the week here’s a dinner recipe from it that’s established itself as a favourite at our table. My usually fussy four-year-old ate every scrap of the recipe below, asked for seconds which he also finished and requested that I make the same again for bringing to his childminder the next day! This is unheard of, but given how nice the recipe is, it’s not that surprising. It’s a chicken dish, made using ingredients that I usually have to hand (yes, I own a bottle of agave syrup, I bought it for some Happy Pear recipes, you could also use honey or sugar). The sauce is really creamy and it carries the flavours of the veg and chicken so well, and the basil lifts it. Heat the olive oil in a large pan over a medium heat. Add the shallots, leeks and chili and cook for about 10 minutes (until soft). If the pan gets too dry add a dash of water. Add the chicken and cook for about 5 minutes stirring often. Add the fish sauce, agave syrup, basil and coconut milk to the chicken in the pan. Stir well and cook for 2-3 minutes. Serve piping hot in a warmed serving bowls along with some brown or basmati rice. This recipe is reproduced with the permission of Gill and MacMillan. 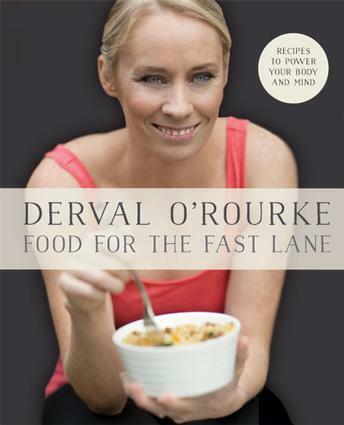 “Life in the Fast Lane by Derval O’Rourke” is published by Gill and MacMillan and available from good bookshops. It’s currently (March 2015) on special offer on the Gill and MacMillan website. Recipes sound fab & really healthy. Would love to win this & give my hubbie a break! Oh this sounds lovely and I love the extra tips you threw in, really useful! Thanks Eimear, it’s a really great dinner, so tasty. Loved this, I made it this evening. Winner all round so will be making it again, thanks!